Citra joined the RSPO in July 2017 as Grievance Manager for Indonesia where she acts as the focal point of complaints handling and communications in Indonesia. Her scope of work includes advising parties concerned on Complaints System & Appeal procedures, methodologies and timeframes, also providing updates on progress of complaints. Prior to joining the RSPO, she was the Head of Forestry and Land Division at Indonesian Center for Environmental Law (ICEL) based in Jakarta. She has expertise on Forestry Law, Forest Governance Index, Timber Legality Assurance System, and Land Based Industry Permit mainly Palm oil and Timber, with more than 5 years of experience in managing projects in various scope of works. 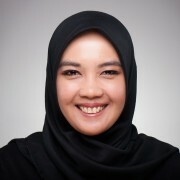 Citra has Bachelor Degree and Master Degree in Law.